The Toronto Blue Jays have lost their final game of 2013, 7-6 to the Tampa Bay Rays. The Rays took an early 6-0 in the first inning, knocking out Blue Jays start Todd Redmond after only two outs. The Blue Jays looked horrible throughout the first five innings, especially in the first before coming to life in the sixth inning scoring three runs. They scored another in seventh, and another pair in the eighth inning. The Rays saw all nine batters set up to the plate in the first inning. Wil Myers hit a double with one out in the first to open up the offense for the Rays. James Loney then hit an RBI single down the first base line. Evan Longoria then doubled to bring in Loney. After Ben Zobrist ground out, Delmon Young hit a single to score Longoria. Matt Joyce then walked. At this point, Blue Jays manager John Gibbons took out Redmond and brought in Neil Wagner. José Lobatón then doubled bringing in Young and Joyce for a 5-0 lead. Ex-Blue Jay Yunel Escobar then hit a single to centre scoring Lobaton. However when he saw the ball being thrown to home, Escobar tries to stretch his single into a double and was thrown out at second base. The Rays’ starter, Matt Moore, walked three batters in the bottom of the first, but thanks to a double play was able to get out of the inning allowing no runs. He gave up only two hits through the first five innings. The Rays would get a seventh run in the fourth inning thanks to a base hit by Escobar and a two out RBI double by Myers. The Blue Jays would try to make a comeback late in the game with a three run 6th inning. It started with with singles by Brett Lawrie and Moises Sierra. Mark DeRosa then brought both in with a double before scoring on a sacrifice fly to right field by J.P. Arencibia. The DeRosa double knocked Matt Moore out of the game. The Blue Jays would add another run in the seventh inning after José Reyes hot a single to open the inning, followed by a Anthony Gose walk. Lawrie then hit an RBI double scoring Reyes. After Sierra walked, pinch hitter Adam Lind (replacing DeRosa at DH) hit into an inning ending double play. The Blue Jays would come within one run in the eighth inning. Langerhans walked to open the inning, and then with two outs Kevin Pillar got a single. Reyes then hit an RBI single, scoring Langerhans. Gose then hit an RBI single to right field scoring Pillar. Lawrie walked to load the bases for the second straight inning before Sierra struck out to end the inning. The Blue Jays would try to at least force extra innings, but fell short. Lind opened the inning with a single to centre field. Pitcher Esmil Rogers came in to pinch run for Lind, before Langehans reached first off a fielder’s choice. 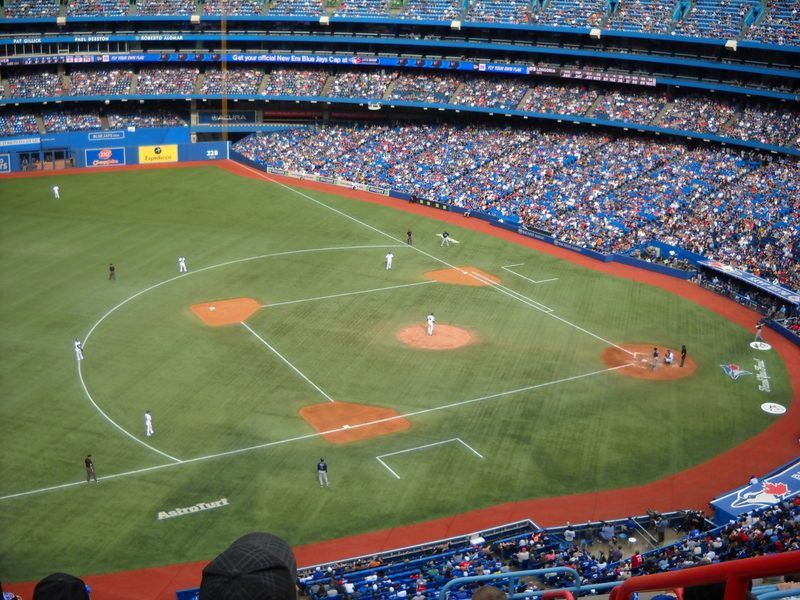 However, Josh Thole struck out (after replacing Arencibia defensively in the top half of the ninth) and Ryan Goins flew out to left field to end the game. Matt Moore picked up the win to improve to 17-4 for the season. Todd Redmond fell to 4-3, while Rays closer Fernando Rodney picked up his 37th save. Darren Oliver pitching in the seventh inning for the Toronto Blue Jays. Veteran pitcher Darren Oliver came into to pitch the top half of the seventh inning, striking out two batters in a 1-2-3 inning in Oliver’s last game as he is retiring after today’s game. He also received a video tribute earlier in the game and accepted a standing ovation at that time (including from the visiting Rays) and also when he entered the game in the seventh. Attendance was 44, 551 with the Blue Jays seeing their attendance reached 2.5 million for the first time since 2007. The game ended with a loss for the Blue Jays, which seems fitting as the Blue Jays won only 74 games this season, one more than last year especially after all the pre-season hype. This entry was posted in Toronto Blue Jays and tagged Ben Zobrist, Delmon Young, Evan Longoria, James Loney, John Gibbons, José Lobatón, Matt Joyce, Matt Moore, Neil Wagner, Tampa Bay Rays, Todd Redmond, Toronto Blue, Wil Myers, Yunel Escobar. Bookmark the permalink.